Once you buy a classical guitar, you will need to buy a few classical guitar accessories before you can start playing. Classical guitarists need various accessories like a guitar case, guitar support, strings, and more. Where to Buy Guitar Accessories? The cheapest and easiest place to buy classical guitar accessories is through the Strings By Mail Website. They carry just about every classical guitar accessory you could possibly imagine, and their prices are unbeatable. Almost all classical guitarists shop from this website. In general, I do not recommend that you try to buy classical guitar accessories from a music retail store. Usually retail stores have a very limited selection for classical guitar, and charge twice the price that you would find on the internet. After you buy a guitar, the first accessory you will need to do is buy a guitar case. Most of the time, you will be able to buy a case at the same time that you buy your guitar. Buying a Case - Which type of case should you buy for your guitar? Buying a Support - Foot Stool, Attachable Support, or Strap? Learn which one to buy here. Buying a Tuner - Which tuner should you buy? Learn about the pros and cons of each tuner. Buying Strings - Learn about string brands, string tension, and string material. Optional Accessories - Everything else you might want to buy. 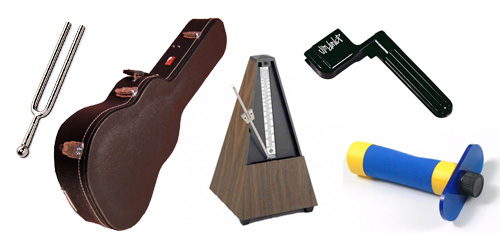 Nail files, metronome, string winders, etc.